Almost Thanksgiving already! Sorry I am so late with this newsletter (download here)—time got away from me. The incessant rain has dragged me down. I was so discouraged about having to cancel the hunter pace after doing so much work to get the trails ready. And the trails are in terrible shape —muddy and eroded —I wish we could send some rain to California. The September member-only ride scheduled for Bluff Point was moved to Machimoodus when we learned that another group was holding a ride at Bluff Point the same day. The footing at Machimoodus was very good. As usual, I didn’t think to take pictures, being a photographer is not in my blood. Liz took a few pictures at the end. The September 20 general meeting was held at the fire museum. We had a lovely meet and greet with veterinarian Erin Trawick-Smith. She talked about her background and interests and we shared stories about our equines. October felt like it rained every weekend. We were forced to cancel our Hunter Pace for the second year in a row due to the wet conditions. Dave’s field where we park the trailers was just saturated. So bummed. Thankfully we have savings to pay for insurance and stuff like that. Hoping for better weather next year. If anyone has any ideas for a fundraising ride or something, please let us know. The Annual Chili Ride on November 11 was relocated from Chatfield Hollow to Pattaconk due to large piles of stone in the cul de sac at North Chestnut Hill. Five of us enjoyed a 2+ hour ride followed by hot chili, cornbread, and delicious desserts. See pictures by Lisa Reneson, Liz Kennedy, and me[!] on page 3. In lieu of a Christmas Progressive Ride this year I will be hosting a ride from my farm on Saturday, December 8. We will be doing a loop in Kenilworth Forest fol-lowed by brunch at my house. Non-riders are welcome to join us for the brunch. I will need a head count for shopping and if anyone wants to bring food, if you can let me know I can plan the menu. 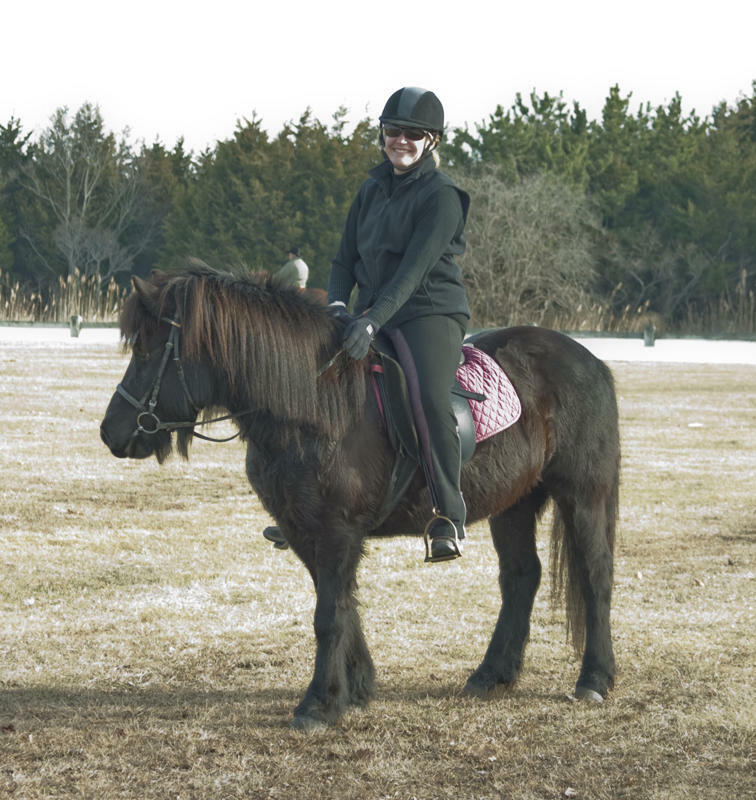 For many years LCRVHC has held a ride on New Years Day at Hamonassett Beach, but when CTRA started doing their ride the same day I was concerned that other park users might be overhelmed by the large groups of horses and complain. What would you think about possibly doing our ride on December 29 or 30 instead? Let me know what works for you! We are looking for a host for the Winter Holiday Party. If you have room for a small crowd and would be willing to host this potluck party the club will provide punch and a spiral ham as well as papergoods. OR—how do you folks feel about maybe having it at a restaurant instead? If you think this is the way to go, we are open to suggestions for restaurants that could accomodate us. Please see the Upcoming Events box on the first page and the Calendar on the last page for more activities. We still really need ideas for the calendar! PS In 2018 membership was down a bit. It’s really a bargain. Only $15 annually for individual, $25 for family. If you have friends you ride with or know people who are interested in trail riding with small groups or working on local trails, spread the word. And please, tell us what you want to do as a club! I can’t believe it’s Labor Day already. The summer flew by but I feel like I didn’t ride very much because it was so hot and humid. One Friday Lexy and I did make it over to Weber Woods for a ride then to Messerschmitts pond for a swim. I hadn’t swum on horseback since I was a teenager. Fun! On Saturday, July 21, LCRVHC held our second annual “Games Day” at Rough Draft Farm. We had a great turn-out, welcomed several new members, and everyone had a blast. About a dozen horses and maybe 15-16 riders participated in various ways. Games included Sit-a-Buck, egg and spoon races, a pizza delivery relay (that was more exciting than expected! ), a sock relay, pole bending races, a mug race, a version of soccer with a giant ball that Gina McManus supplied, and an attempt at broom polo, among others. We followed with hotdogs and a potluck picnic on my porch. Thanks to the awesome grounds crew who set up and helped with the games. And all who shared horses, played games, brought food, took pictures, and helped clean everything up! And thanks to Lexy’s real mom, Sandy Delvecchio, for manning the grill while I got horses squared away. Lexy wanted to do it again before she went back to school but we ran out of summer! Definitely on the calendar for next year! The only bad thing about the entire day was, when Gina got home she tripped and broke her ankle, requiring surgery. Yuck. Best wishes for a speedy recovery. Later the same evening Eagle Scout candidate Daniel Ruppenicker presented his plans for a bridge to be built on the proposed Quinimay South extension to BPC board members Bev Torell, Kristin Elliott Leas, and Tom Elliott, with Gloria and me representing the LCRVHC. We approved his project and it was actually completed on Saturday, August 25. On August 19, Nancy Palermo-Lee, Liz Kennedy, Lexy, and I rode at Hurd Park. Lynda Perry and Kathy Gifford didn’t make it as they spent the morning searching for Lynda’s new beagle, Heidi (now known as Hide-away Heidi) who had mysteri-ously disappeared just as they were getting ready. Luckily she reappeared—but she is still not saying where she was. Thanks to Lexy for leading the ride. And ladies, thanks for a fun ride and a great lunch under the pavillion. 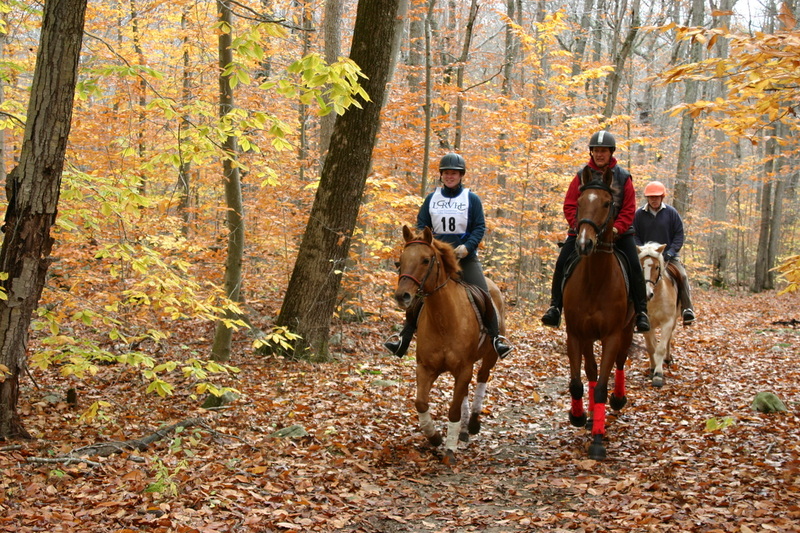 On Sunday, September 2nd, Nancy, Liz, and I worked on the hunter pace route at Weber Woods. There is still more to do so contact me if you can help. PS 2018 membership is down. It’s really a bargain. Only $15 year for individual, $25 for family. If you have friends you ride with or know people who are interested in trail riding with small groups or working on local trails, spread the word. And please, tell us what you want to do as a club! Don’t forget to look for the May/June issue of Connecticut Horse magazine with an article on Connecticut’s oldest riding clubs. 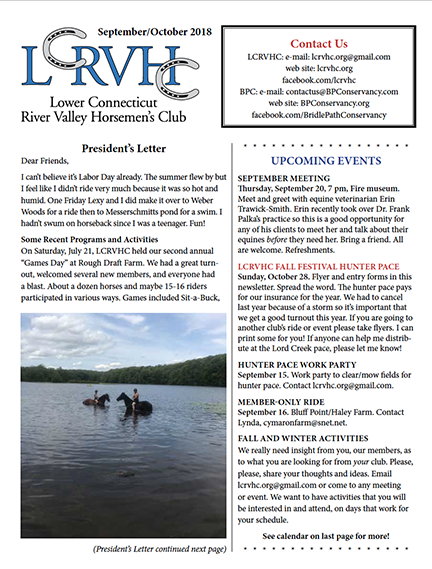 LCRVHC/BPC is featured along with several other clubs. It reminds me what a responsibility we have to this club which has been around since before I was born. It makes me think about the future. If you have young friends who ride with you, bring them along to a ride or work party. The future of LCRVHC depends on it. We are always looking for insight from you, our members, as to what you are looking for from your club. Please share your thoughts and ideas. 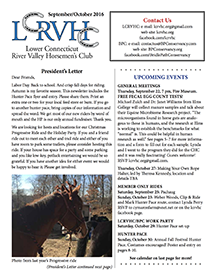 Email lcrvhc.org@gmail.com or come to any meeting or event. Spring! My wooly beasts are starting to shed. I can’t wait for some of the mud to dry up so we can get out on the trails. We have been going to Hammonassett a lot because we can ride on the roads in the campground and on the beach and not deal with the mud. If you take advantage of this, remem-ber to clean up after your horse. 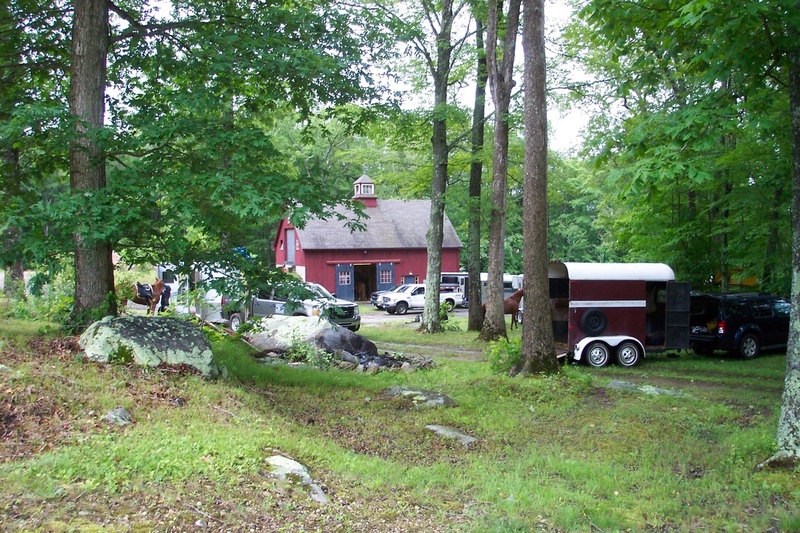 Last Friday night I was interviewed by Sally Feuerberg of Connecticut Horse magazine for an article on the oldest rid-ing clubs in Connecticut to appear in their May/June issue. LCRVHC will be featured along with several other clubs. Thank you to Peg Lupone for supplying images from our archives to share. It reminds me what a responsiblity I feel to this club which has been around since before I was born. It makes me think about the future. If you have young friends who ride with you, bring them along to a ride or work party. The future of LCRVHC depends on it. What a crazy start we are having. I actually had to put a blanket on my wooly mammoth for the first time ever. Homes just seemed tense and cold. On New Year’s Day we went to Hammonasset, it looked like Antartica! I have never seen Long Island Sound so frozen. It makes me just want to hibernate. And the ice jams in the Connecticut River—I just dread what may be happening to the trails at Machimoodus, Hurd Park and the Meadows, maybe even Lord Creek. As you know the Bridle Path Conservancy has been operating without a president for over a year now. No longer! Beverly Torell has stepped up and offered to serve in this capacity now that she is retired and has more time. A HUGE thank you to Bev! Please support her and the entire BPC board, they are our trails committee! With the new year we are, as always, looking for insight from you, our members, as to what you are looking for from your club. It seems like, although our membership numbers are pretty steady, attendance is down at meetings and activities. Is this because the programs we have been having are not of interest? Or because it is easy and quick to get information on line? Or just because our lives have become so busy? We have been trying to have less meetings, more outdoor activities, social events, riding, and eating. We have been more flexible, changing dates and times to perhaps allow different folks to participate. Please share your thoughts and ideas. Email lcrvhc.org@gmail.com or come to our 2018 planning meeting on February 8 or 9 (TBA) at Alyce Malleks’ house, 44 Jannas Lane, Madison. You will notice that this newsletter is pretty loose. We are waiting for your input! 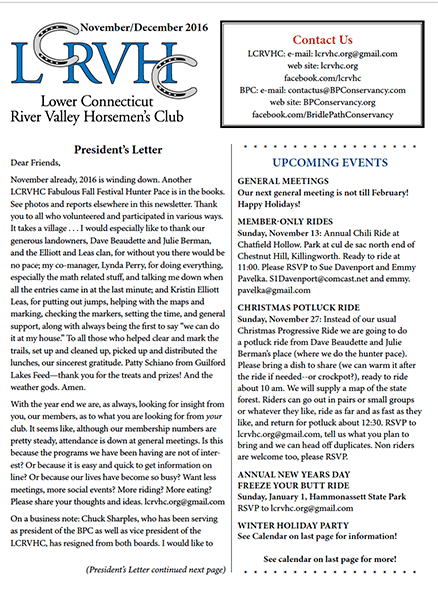 On November 12, LCRVHC held our annual Chili ride at Chatfield Hollow hosted by Emmy Pavelka. 9 riders enjoyed about a 2 hour loop followed by chili and desserts and visiting. Andrea and Kayden Vanderweide were kind enough to bring Sue Davenport who has been having some health issues. It was so good to see her. Our annual winter holiday (Christmas, New Years) was held on Saturday, January 13 at Kristin and Mark’s house. There was an awesome variety of food. We held a free raffle for some horse treats that were donated by Lakeside Feed as prizes for the hunter pace that was cancelled. It was fun to see some of our previous (returning) members like Bev Torell and Doro Fuller as well as our friend/photographer, Judy Bosco. About 25 people were in attendance. Please see the Upcoming Events box on the first page and the Calendar on the last page for more activities. We really need your ideas for the 2018 calendar! PS 2018 membership renewals are now due. If you joined for the hunter pace or renewed at the Chili ride (or in November and December, you are good for 2018). Everyone else, there is a renewal form in this newsletter. It’s a bargain. Only $15 year for individual, $25 for family. Don’t make Alyce chase you. Send it today! Summer is in full swing. I hope everyone is getting lots of riding time. I just got back from vacation and am enjoying the beautiful weather. Able got a new (used) wagonette and enjoyed lots of attention in the Madison 4th of July parade! Download the newsletter here. We are desperately seeking a president for the Bridle Path Conservancy, and the BPC could use other help as well—maybe someone to do web site and Facebook updates, get involved with planning, etc. If you are interested in helping out with trail preservation and maintenance please consider joining the board. Contact BPC Vice President (acting president) Kristin Elliott Leas (equineinsight@gmail.com). On Sunday, May 21, 2 groups with chainsaws and 4-5 riders held a Clip & Ride and Spring clean-up in Weber Woods and the Quinimay Trail. Kristin and Mark tackled a huge tree that had fallen in the trail on canter hill, while Rob Butterworth, Dave Beaudette and I worked on several others that were across the trail. Lynda Perry led the riders and found more work for us! The May 25 Yoga for Riders meeting/program was a lot of fun for a very small group. Four members got a lot of personal attention from instructor Wendy Cartier. Wendy left some extra handouts so if anyone was not able to attend but is interested in some stretches for riders, let me know, I will try and remember to bring them to the picnic. On June 3, members of the LCRVHC, BPC, CFPA, and CT-NEMBA joined forces for our 11th annual combined arms work party. We worked on the approaches to a bridge that was previously built by an eagle scout. The turnout was smaller than previous years but we still finished our project and squeezed in a quick picnic lunch before the rain came. Thanks to everyone who helped out. The Games Day on June 25 was a lot of fun. It made me wonder why we hadn’t done it for like 10 years! We kept it very casual with riders switching teams for different relay races. When Lynda posted pictures on Facebook some members expressed disappointment that they had missed it. If enough people want us to do another one, I’d be up for it. Please e-mail lcrvhc.org@gmail.com. The Fall Festival Hunter Pace is right around the corner. I have included a Poster and Entry form in this newsletter. Please print and post or share! Thank you! Please see the UPCOMING EVENTS box on the first page and the CALENDAR on the last page for more activities. We REALLY need your ideas for rest of 2017! Labor Day. Back to school. And crisp fall days for riding. Autumn is my favorite season. This newsletter includes the Hunter Pace flyer and entry. Please share them. Print an extra one or two for your local feed store or barn. If you go to another hunter pace, bring copies of our information and spread the word. We get most of our new riders by word of mouth and the HP is our only annual fundraiser. Thank you. Enjoy our most recent Newsletter! Download here. Our May/June Newsletter is available here. Here is the newsletter. Lots of great pictures and upcoming activities.